Home / App / How to / Watch And Enjoy Unlimited Free Live Channels On StarTime App. Watch And Enjoy Unlimited Free Live Channels On StarTime App. 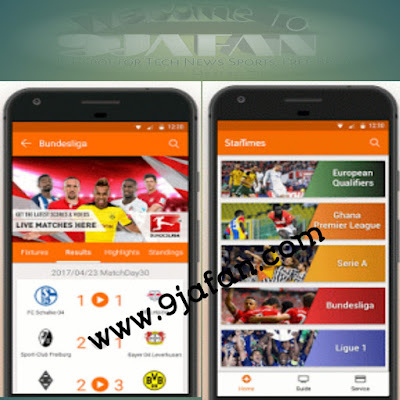 StarTimes App providing Free live streaming service of Live TV channels, exclusive LIVE football matches (Bundesliga, Serie A, Ghana Premier League, FIFA, ICC, Ligue 1) and online videos, plus TV guide of all 400+ channels on StarTimes’ digital TV platform. StarTimes Digital Company has declared that all users will continue to enjoy unlimited free trial subscription on StarTimes app without paying anything. Apart from Streaming free live channels on the StarTimes app, The app also makes it easier for users to earn free coins when they open the app daily or invites their friends to download the app using a referral code. This free coins can be redeemed for airtime or shop items inside the app. you can use my referral code 1558259 when downloading it to earn 1000 coins. Watch Live TV channels for Free. Watch Catch up on the most popular TV shows, sports, news, movies, series, music. Free online videos of entertainment, movies, series of love, mystery, romance, comedy, action, Kungfu etc. Best Football/Soccer Live Streaming App: Live football match, Live score, latest football news, soccer highlights, i.e. Bundesliga, Serie A, GPL (Ghana Premier League), FIFA World Cup, ICC, Ligue 1, European Qualifiers, plus news of EPL, La Liga, AFcon and other sports such as Boxing, NBA, Cricket, Rugby, Tennis, Formula E etc. Full 9-day TV Guide and set timely reminders to plan your watching. Best Live TV Programs recommendation every day. Hollywood, Nollywood, Bollywood, Telenovela, Yoruba movies, Chinese Kungfu movies, Bongo movies. Free live TV Channels on air now. And Many More Live TV Channels in Ghana, like: Adom TV, JOY PRIME, GTV SPORTS PLUS, GTV, UTV, TV3, GH One, Metro TV, 4STYLE TV, TV Africa, AMC MOVIES,ST MUSIC, ST BOLLYWOOD Africa, NGW ect. More channels and catch up coming soon for this app. 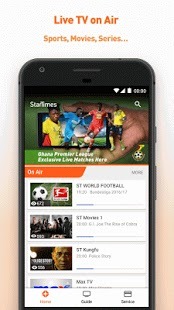 Download Startimes Live Streaming App For Free From Playstore.